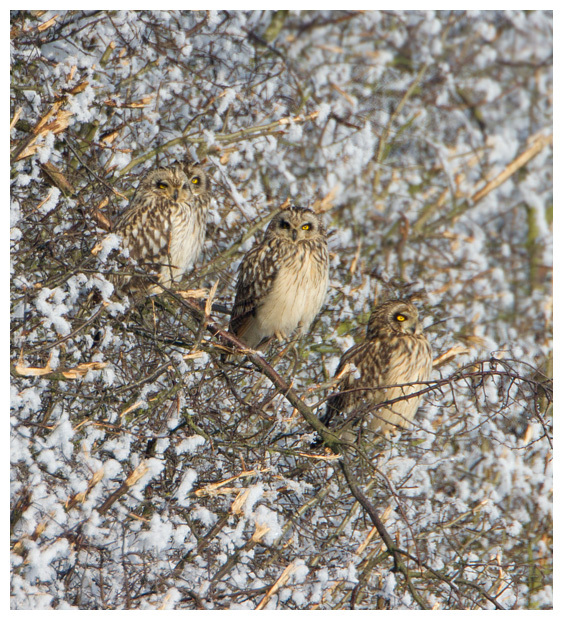 Every winter I find myself standing in the cold waiting to see and photograph short-eared owls. They are without doubt my favourite bird to photograph and despite having thousands of images of them, I still want more. I thought it might be a good idea to write a brief article on them based on my countless hours spent observing them. I first got a taste for these striking looking owls back in 2008 when a friend happened upon one at a reserve near Milton Keynes, and invited me along to look for them the following weekend. After seeing them hunt, perch and stare at me, from close quarters, I was hooked. For me, their eyes are the key element to these owls. Unlike barn or tawny owls which have black eyes, these are feline with yellow irises and black pupils, and are surrounded by black feathers giving an impression of eye-liner being used. And when they stare at you, it's quite an arresting sight. They get their name "short-eared" from the feather tufts that can be lifted on the top of their head, usually as a sign of alarm or defence. 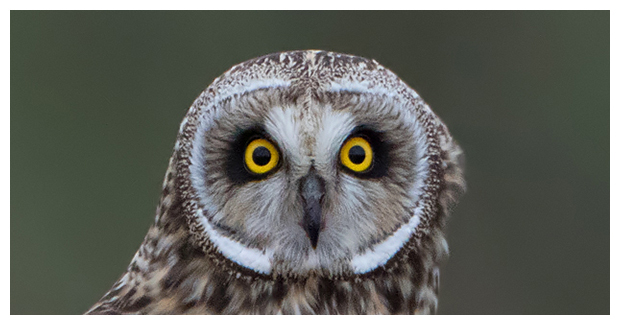 Long-eared owls also do this, but their tufts are well, longer... hence the name! 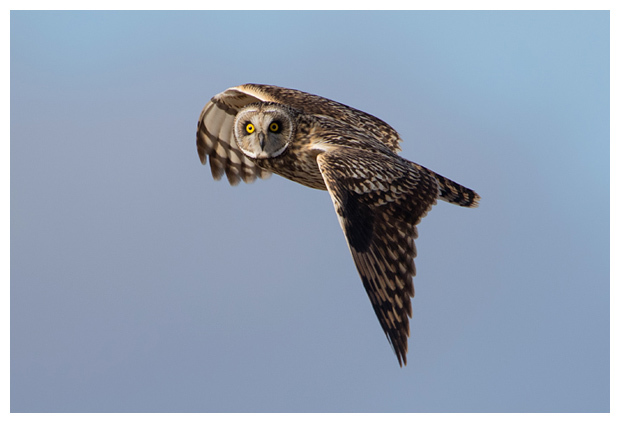 Short-eared owls seem to be able to change their facial appearance too, transforming the look of the owl significantly. So much so, one might assume wrongly that they are different individuals. 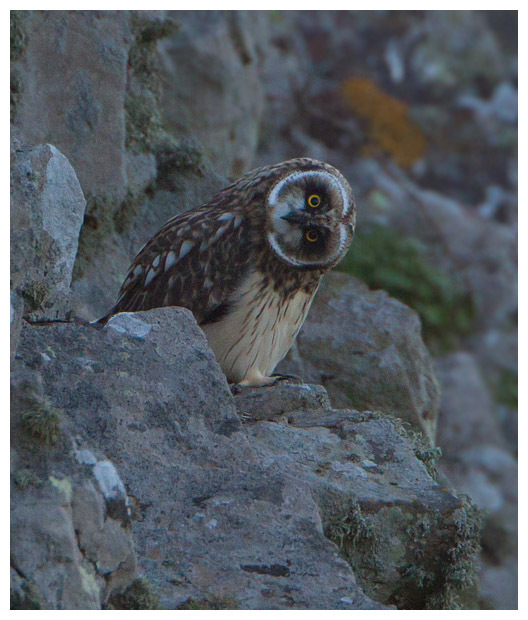 I usually see these owls when they are over-wintering on areas of scrubland, often on high ground. Typically they start to gather at these locations late in October, and leave towards March the following year. They also like areas that are prone to flooding, such as tidal marshes and flood plains. The rising water flushes out their prey and makes hunting somewhat easier. When more than one owl roosts at a particular site, there can be a period where the owls battle for the rights to hunt over certain patches of the land, and also when they can hunt. I observed this behaviour at a site in the Cotswolds where for several weeks the owls seemed to be fighting each other more than they were hunting, but after a while, this subsided and the owls seemed to then come out at different times to hunt, and stayed in certain areas. Fights can last only a few seconds with the owls chasing each other in flight, calling out and clapping their wings. The latter is something they also do when trying to pair up for the breeding season, but I'm yet to see this myself. 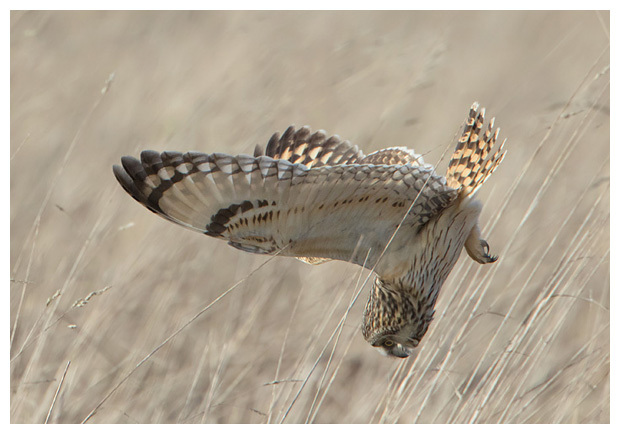 They can actually make contact when flying, often locking talons and rolling over in mid-air. I've never seen them take each other down to the ground, as they release after a second or two before it's too late. Even when these territories have been established, the short-eared owls have to contend with other birds around the areas, such as barn owls and kestrels, both happy to steal prey. Plus most corvids will either try to steal the prey or be simply happy to mob the owls as they fly around. On hunting grounds in the summer, the owls also have to put up with raptors such as hen harriers, which will be sharing the same area for their own hunting needs. 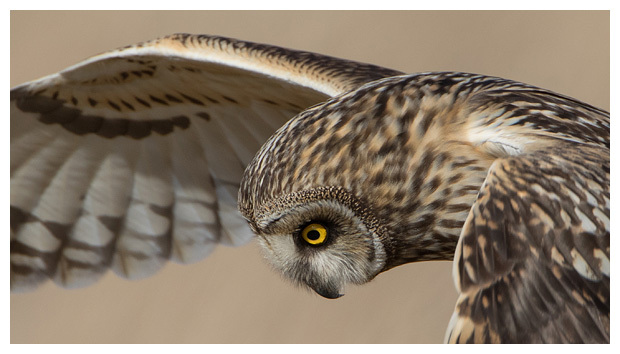 Short-eared owls are both diurnal and crepuscular, which means they hunt day and night. Again, this is one of the reasons photographers like them, as they can be seen hunting in broad daylight. They don't like very windy conditions or rain, though I have seen them hunting when it is snowing or when light rain is falling. After diving down into wet vegetation, they will often perch up somewhere to hang their wings out to dry. 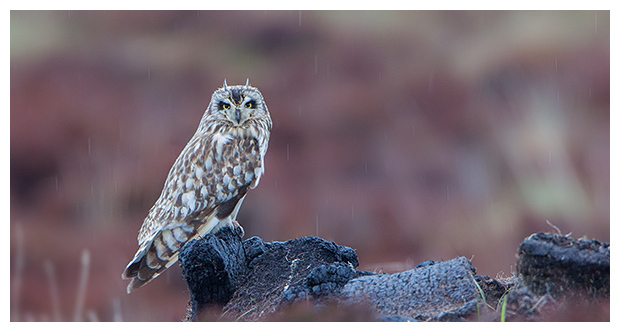 When planning a visit to a site to photograph them, it is wise to check the forecast, and try to time it so you arrive after a period of wet weather, as the owls will be hungry and more likely to appear earlier to hunt. Their prey is typically small rodents, such as mice and voles, but I have seen them chasing flocks of birds too, such as finches and pipits. When perched, they are relatively small birds, but once those wings are unfolded they seem to be much larger, especially in flight. Because they generally hunt over wide open spaces, they have longer wings than say a tawny owl, as that needs to be able to zip between trees and branches to catch prey. These need to be able to quarter meadows and fields, gliding and briefly hovering at times, to locate and catch their prey. Whilst slowly flying over the fields, the owls move their heads around, presumably to spot movement below, or more likely to enable them to hear it. This of course makes them a dream to photograph, especially when one happens to look in your direction as it flies by! 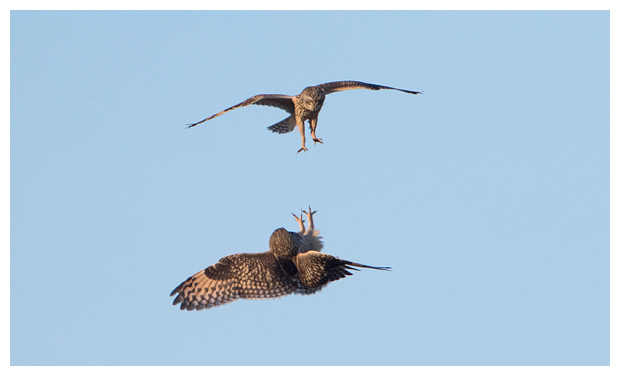 Sometimes hovering over the prey, or more often going from flight into a dive, the owls stoop head-first into the vegetation to catch the prey, bringing forward their legs at the last second to stamp down, and stun or kill whatever they were after. Once on the ground, the short-eared owl will mantle the prey, spreading its wings out in a defensive posture, turning its head this way and that to check nothing is approaching to steal the catch. At the same time, beneath the wings, it is grabbing and killing the prey with its sharp talons on its feet. Unlike barn owls which seem to wolf down the whole of the prey in one go, these owls seem to tear up the prey to consume in smaller pieces, and sometimes discard parts like the intestines, which may be full of the vegetation that the rodents have been eating and isn't what the owl wants to consume. When prey is plentiful, the owls will often cache caught prey in larders around the area, hiding the kills to be eaten at a later time, perhaps when the weather is unsuitable for hunting in. Of course this needs to be a good place, as other predators such as barn owls, other short-eared owls, kestrels, and even corvids will raid such a larder if discovered! 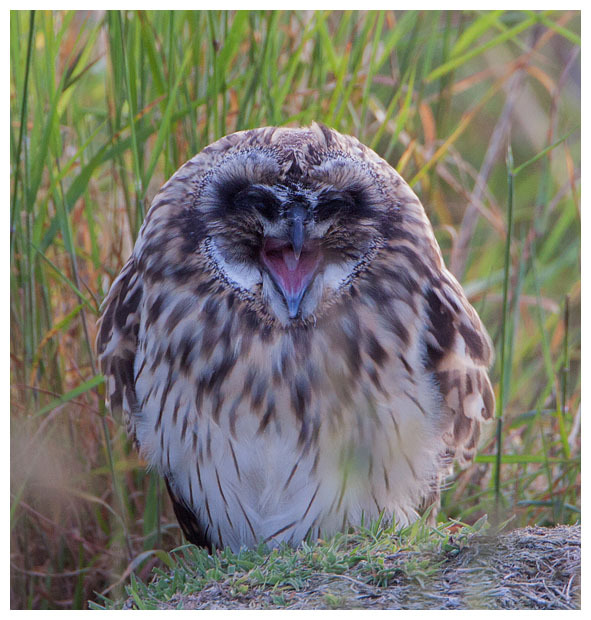 As with other birds of prey, short-eared owls regurgitate the bits of indigestable material in pellets, which can be found beneath favoured perching posts or branches. These pellets are smaller than those produced by barn owls, but contain similar material, such as bones and fur. 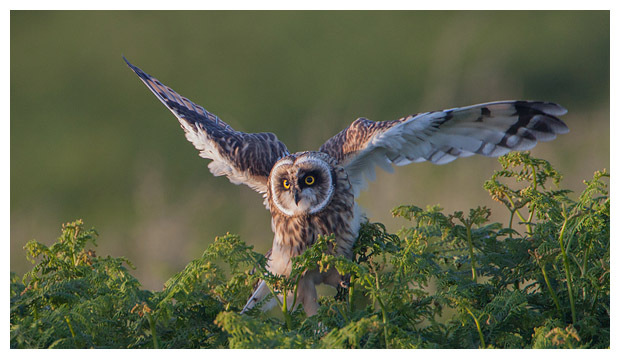 Typically when roosting short-eared owls will sit alone in long grass or vegetation, on the ground. They are so well hidden with the markings and patterns on their feathers that once sat still, they seem to disappear into the surroundings and can be hard to locate even when you know where they landed. However, in cold weather they have a tendancy to roost together, perching beside one another in hedges or trees. On one trip to a site in Northamptonshire back in 2011, when I arrived early morning in thick fog and freezing, snowy conditions, the car's gauge showed the outside temperature to be -16C. As the fog started to lift, I was greeted with the sight of over a dozen short-eared owls perched beside one another in a hedgerow. Quite a sight! 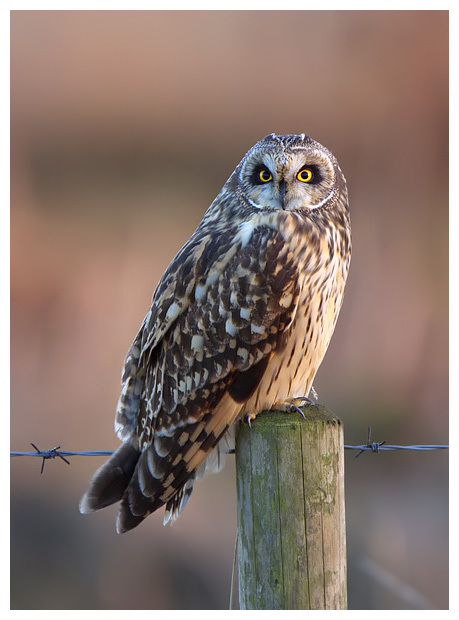 Short-eared owls breed in the UK, though finding them usually involves a longer trip than watching during the winter. I have seen them during the warmer months in locations in Scotland such as Mull, Skye, Uist and also on the small island of Skomer, off the Pembrokeshire coast. The nest is on the ground and from my observations is often well hidden amongst heather or long grass. The female owl will sit on the eggs (she usually has a browner face and is hence better camouflaged), leaving the male to go out hunting and bring back prey to her. This continues when the chicks hatch until such a time that the nestlings are more mobile and the female also helps with the feeding. The nestlings have a rather strange appearance, with very dark faces and lack the striking looks of the adults. They also don't do a great deal, and on Skomer when the weather was rather warm, I watched one sitting in the long grass, beak wide open, trying to lose some heat! Once out of the nest area, the owls start to test their powers of flight, and are somewhat amusing in how clumsy they appear to be, especially when trying to perch up again. The adults still bring food back to the nest area during this time and the fledged owls fly back to collect the food, or if they're lucky, have it brought over to wherever they're perched. As with any young creature, everything is interesting and the owls are curious of anything that moves nearby, often rolling their heads over for a different view on it. Did I mention they were great to photograph? Because they hunt in daylight, because they fly relatively slowly and because they perch up often in the open, short-eared owls are fabulous to photograph. They can pose a challenge for focusing when flying against similar coloured backgrounds, or flying quickly when fighting. And they don't always come out to hunt when the conditions would appear to favour it. But the missed chances or no-shows are all worthwhile when you spend time with them on a sunny afternoon. Finally, they can also be tolerant of people, which allows for close encounters, provided basic fieldcraft and common sense are applied. This tolerance seems to improve over each winter when the owls become used to people being around. 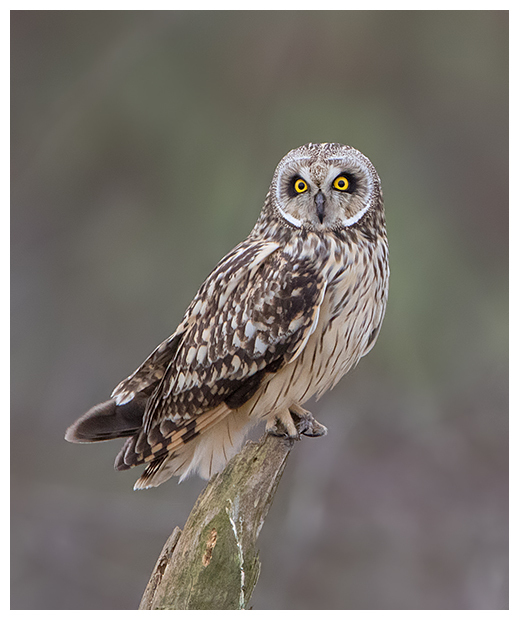 The short-eared owl, Asio flammeus, my favourite subject to photograph.